On Saturday night in Atlanta, less than 24 hours before Tom Brady takes the field for his ninth Super Bowl, Baker Mayfield should take the stage and accept the award as the NFL’s Offensive Rookie of the Year. Giants running back Saquon Barkley was the betting favorite to win the award for much of the season before Mayfield’s late surge. Mayfield nosed in front by the end of the year, barely, and the voters for the AP award to be handed out at the NFL Honors show were likely divided. Barkley put up huge numbers in the country’s biggest media market, nearly justifying New York’s short-sighted decision to draft a running back over a quarterback with the No. 2 pick. He totaled a jaw-dropping 2,028 scrimmage yards, 15 touchdowns and 91 catches. The numbers give him the edge over Mayfield. They don’t tell the complete story. Position matters, just like it did when Mayfield beat out Barkley for the Heisman Trophy and to be the No. 1 pick of the Browns. Quarterback is far more difficult and important than running back. Barkley’s brilliant statistics helped the Giants win five games. They won three without him in 2017. Mayfield was already voted Rookie of the Year by the Pro Football Writers of America and deserves to double up with the “official” award from the AP voters. The reason is simple: He transformed the Browns. Anyone who’s been paying attention for the last 20 years knows the Browns have been dragged down by dysfunction and a dreadful culture. The ESPN Magazine article released last week further drove home the point, as if 1-31 over the previous two seasons wasn’t enough proof. Mayfield was as productive as any Browns passer in recent memory. He completed 63.8 percent for 3,725 yards, 7.7 per attempt, 27 touchdowns, 14 interceptions and a 93.7 rating. Those numbers included a mediocre start before the midseason coaching change. 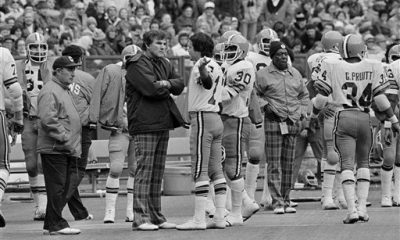 They were still good enough for the most touchdowns by a rookie in NFL history and the most yards for a rookie in team history. The sterling stats don’t come close to being his greatest achievement. He refused to be burdened by the organization’s history of losing. He wouldn’t even acknowledge it. The fresh start is what the Browns and their fans needed. Mayfield provided it, and the hope that is running rampant at the start of the offseason. People believe he can rid the franchise of any demons lingering with owners Dee and Jimmy Haslam, or at least overcome them. That’s what happens when a team goes from 0-16 to 7-8-1. Mayfield should be Offensive Rookie of the Year. More interesting to me is where he fits in the NFL’s landscape of quarterbacks. In the final eight games, after new coach Freddie Kitchens took over as coordinator, Mayfield ranked second in yards per attempt (8.57), tied for fourth in touchdowns (19), fifth in rating (106.2) and ninth in completion percentage (68.4) and yards (2,254). The numbers are more than impressive, but it’s fair to wonder if it’s too early to put Mayfield in the upper echelon of the league’s quarterbacks. Brady, Aaron Rodgers, Drew Brees, Ben Roethlisberger, Russell Wilson, Philip Rivers and Andrew Luck have top-10 spots locked up in my rankings. It’s only been one season, but Patrick Mahomes, who’s the heavy favorite to be named MVP, must be included and may even jump to the spot behind Brady and Rodgers. The list gets cloudy after the top eight. Cam Newton and Matt Ryan are former MVPs and NFC champions. Then there are the young contemporaries to whom Mayfield will be compared for the next decade: Carson Wentz, Jared Goff, Deshaun Watson, Mitchell Trubisky, Sam Darnold, Josh Allen and Josh Rosen. 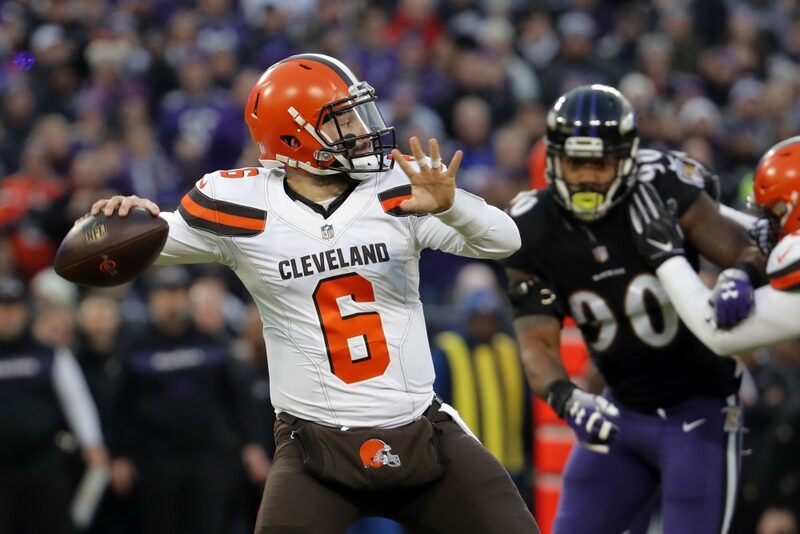 In order for the Browns to take the next step many are forecasting for next year — making the playoffs — Mayfield must play like a top-10 quarterback. He’ll have plenty of chances to prove he belongs among the elite, as he’ll go head-to-head with Brady, Roethlisberger twice, Goff, Wilson, Darnold, Allen, Rosen and Jimmy Garoppolo. Mayfield will approach the challenge with confidence. He doesn’t doubt his talents or himself, and neither do Browns fans. Mayfield should win Rookie of the Year. It should just be the start for him.